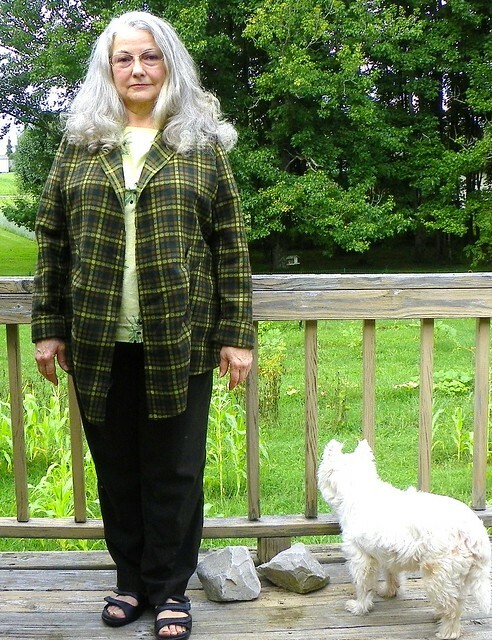 Sandra Betzina’s summer 2013 jacket pattern, Vogue 1364, is unlined and has no front closing mechanism. Fortunately the pattern is drafted so well the front pieces lie nicely with no need for constantly arranging the fronts. Ann at GorgeousFabrics.com offered this polyester, acetate, and acrylic fabric as a FOTD, (Fabric Of The Day) a offering she makes to her GorgeousFabrics FaceBook friends at a deep discount and the colors are perfect for so many different pieces in my wardrobe and on my stash shelves. I took advantage of her, er, her generous offer and bought 3 yards. What a steal! It is a dry clean only fabric and I usually don’t tolerate having such in the stash but I couldn’t say no to the pretty colors. I researched the fabric components and have decided I may try to hand wash and lay flat to dry. Let me just say this fabric made the whole sewing process a joy. I wasn’t up for fancy complicated stuff, I simply serged the edges and turned under 2x to finish the edges. I started out with a very cool iron due to the acetate and acrylic content but kicked it up to a wool setting and steamed the folds. No sheen or shine, no bunching under the iron and no melting on the sole plate. I didn’t want to do a Hong Kong finish and since this fabric was so darned easy to work I flat felled the seams. Now that I see photos of this jacket on me I think it could stand to lose an inch or more of length. And I should take the time to make some shoulder pads as recommended. It’s been a long while since I’ve sewn up a Sandra Betzina pattern and I have such a rotten attitude toward pattern instructions her amount of verbiage made me nervous. However, she packs in great tips and techniques, it’s worth the reading time to take it all in. This turned out to be a really fun sewing experience, thanks to the fabric and to the well-drafted pattern and excellent instructions. 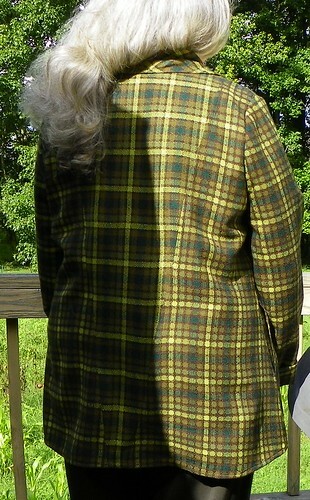 Posted in Fabric, Pattern Reviews, Sewing and tagged Pattern Reviews, Sewing. Bookmark the permalink. First, let me say it is a great pattern and you made it beautifully. Then I have to tell you that I re-read the beginning of the blog and saw “summer jacket” and started to laugh, wondering just where you live that you can wear a jacket in the summer? I am 20 miles north of Philly and in my 16th year of hot flashes! I barely wear jackets in the winter!!!! All kidding aside, it is a pretty pattern and you made it beautifully. Not for me, other than for much colder weather and only in 100% natural fiber inside and out. Hot flashes are a real pain and I truly miss wearing all my beautiful winter suits. The first jacket I bought on living in Minnesota for a while, was a quilted cotton jacket and it was WiNTER! May you wear this in good health and may cool breezes come your way so it is always comfortable. You’re right, Ms Rose in December, I made a mistake in titling the post. I toyed with calling it Southern Fall but then got distracted. LOL Since cancer I am cold much of the time so I’ll put on sweaters when it’s over 70. Hope your hot flashes get better. Hi again, Nancy: I have been mulling over your comments and while I appreciate your encouragement concerning the results this fabric and pattern made so easy, I think I may not have made it clear that this fabric is perfect for warm weather, not an insulating fabric at all. The fabric (polyester, acetate, and acrylic) is lightweight and breathable and is quite suitable for a jacket for even someone like you. I will plan on looking for this hand and fiber content again when I need another throw on to wear into town. 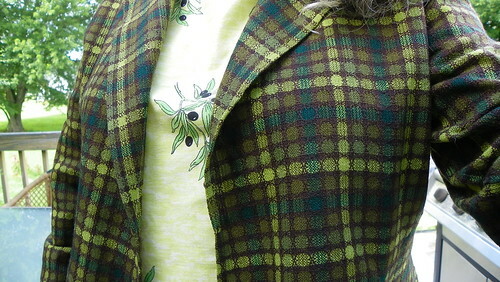 If you are still sewing garments for yourself you might want to consider using it or something similar while it’s still available on the GeorgeousFabrics.com website. I remember pre-hot flashes days when I did not blink about wearing something synthetic, if it suited my style, but I also remember trying to wear some of those gorgeous Evan Picone poly blouses post-hysterectomy and felt like I was in a sauna. What you have said leads me to believe maybe synthetic fabrics have changed? I have been avoiding them like the plague but with your encouragement, I may just give some a try. I have a lot of patterns, and plans to sew, but refuse to do so until I get to a weight where I am more comfortable. I do not mind making from scratch butI hate to alter a finished garment. I will check out Gorgeous Fabrics more thoroughly. I have been rather limited to cotton, wool, silk and linen since the surgery – all costly. Yes, some of the fabrics are not as heat retaining as they used to all be. I remember Evan Picone and I had one in rayon that was shaped similarly to the tops I’ve been doing. It was not a heater, LOL. Anyway, this fabric in particular is a loose weave so it breathes. I am guessing you could use it for a loose topper/wrap/jacket in 60 degree weather or in rainy, low humidity situations. I like to look “dressed” when I go out. Another more dressy fabric for warm weather toppers is cotton boucle, with an silk organza underlining/interfacing. The organza gives the limp boucle some structure and makes the garment longer lasting. Sewing for our too fat bodies: Yup, I went through the same hesitation, since I’m finally back to my pre-cancer weight, which is too much weight, but boy, I’ve loved eating again without my stomach going too crazy. Hopefully I’ll change that trend and start losing again with more activity and well-being. But in the mean time, I just finally decided sewing feeds my soul and I’m better off sewing for my body as it is. Gee, I do hope you’ll join me in sewing for us as we are 🙂 You just can’t beat a well-seasoned woman IMHO. Perhaps a quick consult with Ann over the phone might steer you to an appropriate fabric? And may I mention, should you choose to take on a tailored jacket, that http://www.fashionsewingsupply.com has great wide width organza. And Pam also gives great customer service as does Ann. But you know they are my buddies so I am terribly biased. Be well, enjoy what ever you decide to do! MB…your jacket is fabulous. Love the color on you too!